These personalized apothecary jars are the perfect graduation party candy jar favors to make a unique impression in honor of your graduate! We offer many colors and designs to personalize these apothecary jar favors. Each clear glass jar measures 1.75" x 3" and is in the classic apothecary shape with a hinged lid and a silver metal air tight locking gasket designed to keep the contents fresh. 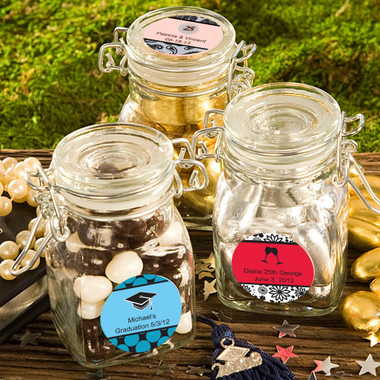 You can fill with graduation candies, potpourri, confetti, tea, coffee or any other fun filling - jars arrive empty. Both the front and the lid are perfectly fit for the application of the label of your choice. The labels are included in self sticking sheets for you to easily apply. These jar favors come bulk packed in individual poly bags. My orders just arrived today. Everything seems in perfect condition. From the time of ordering to delivery everything is excellent. When another occasion comes along will surely buy here, prices are great. Thank You to all.